This past August 2015, the Primate Research Center (PSSP) at Bogor Agricultural Univ. (IPB) and the Univ. of Washington (UW) celebrated the 25th anniversary of their collaborative field training program on Tinjil Island. They also celebrated the 20th anniversary of the associated UW study abroad program established in 1995. 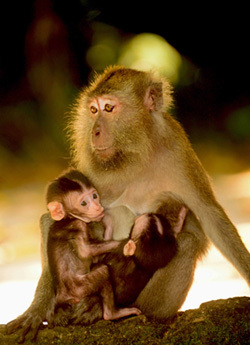 Tinjil Island has served as a Natural Habitat Breeding Facility for long-tailed macaques (Macaca fascicularis) for over 25 years. In 1991, Prof. Randy Kyes and his colleagues at PSSP-IPB established an annual field course in primatology on Tinjil for students from IPB. The success of this field course lead to the establishment of a UW study abroad program (International Field Study Program-Indonesia) in 1995 and the opportunity for students from the U.S. and Indonesia to study together in the field on Tinjil. 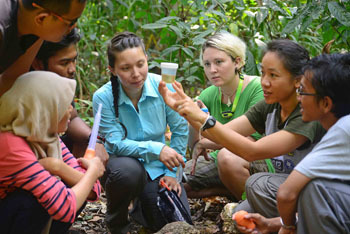 Over the years, the Tinjil field training has expanded in breath and focus which is reflected in the current title: “Field Course in Conservation Biology & Global Health: At the Human-Environment Interface.” During the month-long program, students live on the remote island and participate in lectures, field exercises, and conduct independent research projects. The course concludes with an outreach program for local school children back on Java. To date (Aug., 2015), a total of 327 students have participated in the Tinjil field course, including 231 from IPB and institutions throughout Indonesia, 82 from the UW/U.S., and 14 from several other countries including Bangladesh, Denmark, Japan, Mexico, Sweden, Thailand, and UK. Many have gone on to careers in science and applied fields in conservation and global health. My experience in Indonesia was both my first field research project as well as my first time traveling international. It really opened up the door for me that lead to many years of research and travel. One of the most amazing experiences of my life. My experience during the Tinjil field course was my first and remains my only opportunity to participate in naturalistic observation research. Previously coming from a basic science laboratory experience, this experience helped me to ultimately carve a middle path and pursue a career in translational clinical research. In addition, this course exposed me to Indonesia, the Indonesian language and people, animal conservation techniques, the southern hemisphere, and the amazing natural beauty of Tinjil Island. The experience on Tinjil Island was life changing. I went from hopes of a business degree to pursuing a career in laboratory animal science. Furthermore, my experiences in Indonesia introduced to me - and instilled in me - a love of learning other cultures and traveling around the world. The Tinjil Field Course was profoundly influential to me both personally and professionally. It is a great introduction to conservation field work, international work, and to Indonesia. Within a few years of attending the Tinjil field course I found myself back in Indonesia as a conservation professional. Although currently living and working stateside, I plan to return to Indonesia and continue conservation and environmental education activities there. For me the International Field Study Program-Indonesia was truly life changing. My participation in the program enabled me to take advantage of multiple opportunities that I had never believed possible. I thank Professor Kyes for encouraging me to take part in the IFSP and for inspiring me to continue my academic pursuits far beyond my initial participation in the program. My participation in the IFSP almost 7 years ago has been the single most influential experience in my academic career to date. Professor Kyes’ dedication and the passion he puts into ensuring the program’s success translate directly to the IFSP’s positive impact on participants year after year. My involvement with IFSP Indonesia has been the single most life changing opportunity I have had. It has given me direction for my future career goals, including a new found love for the Indonesian people, culture, and language. My involvement with IFSP continues to facilitate additional educational and community outreach opportunities, of which all have proved invaluable to my growth as a future academic professional. (This alum attended the field course as a UW undergrad and is currently the Patient Care Coordinator at the Seattle Neuropsychiatric Treatment Center. She plans to pursue a graduate degree focusing on conservation biology in Indonesia). I would like to update you in what I've been doing. I applied to ETCH (education transforming community healthcare) and was accepted! It's a group of medical, nursing, and undergrads students that organize healthcare information sessions at homeless shelters around Seattle. I also applied to health care alternative spring break where we visit a rural community in Washington and learn about how a healthcare system is run in a rural setting! Lastly, I applied to global medical brigades a trip organized by students that results in a 1 week medical clinic in Nicaragua!!. Your program really inspired me to do all this. I never realized how much I enjoyed engaging in activities like this. I appreciate it all very much and hope to go into global health care later in life! PSSP-IPB and UW are proud to celebrate 25 years of field training on Tinjil Island and believe this program represents an excellent model of international collaboration. Key colleagues in this training program include: Dr. Entang Iskandar, Dr. Pensri Kyes, Prof. Dondin Sajuthi, and Dr. Joko Pamungkas. 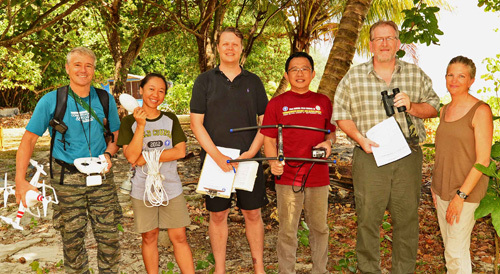 Supporting instructors in the 2015 field course included Dr. Matthew Novak, Dr. Kimberley Phillips, Justin McNulty, MS, Dr. Anom Bowolaksono, and Dr. Wichitra Singhirunnusom. Supported in part by: PSSP-IPB; IPB International Office; Washington National Primate Research Center, UW; One Earth Institute; US-Indonesia Partnership Program; South East Asia Center of the Henry M. Jackson School of International Studies, UW; American Institute for Indonesian Studies; ORIP-NIH Grant No. P51OD010425 to WaNPRC.